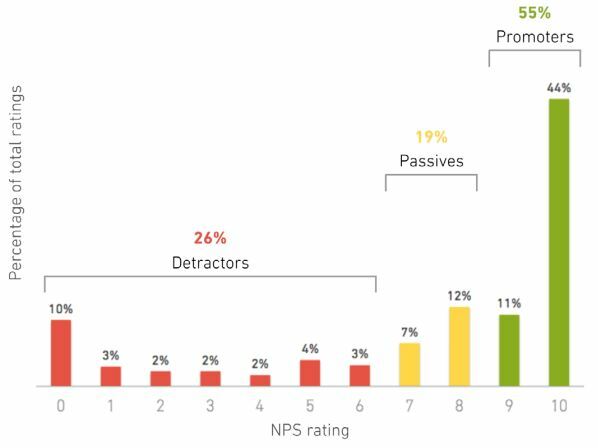 I'm hearing more and more questions over time from founders, execs and marketers at startups about NPS (net promoter score). If you are not familiar with NPS, check out this overview and my interview with the creator of NPS. We used NPS extensively at HubSpot starting when Jonah Lopin implemented it around 2009 (he's now founder of Crayon, check it out if you do any marketing or design work - I'm an advisor and investor). NPS can be a very valuable tool in measuring customer happiness and the underlying growth potential of your startup, if it is used properly. Unfortunately, from the questions I have been getting, I worry startups are misusing NPS, so here are some of my thoughts. How can I use NPS at my company? Customer NPS - Ask all of your customers the NPS question on a regular basis. If you have a large enough customer base, I would recommend breaking it into groups and asking a batch of customers each month so that big events (world economic events, major product outages) do not skew the data too much. You can then analyze the responses quarterly or bi-annually. Usually monthly is too noisy to be worth looking at - in my experience NPS changes over long time periods (think geological time) so obsessing over short term numbers can be frustrating. Don't forget to analyze the text responses (the most valuable part of NPS) by having someone read them and then group into buckets and tally them by each topic and the promoter / neutral / detractor for each topic. Transactional NPS - Ask customers about their satisfaction with a specific interaction with your company. "Based on your interaction with our support team this week, how likely are you to recommend our support to someone else?" This is a great way to measure a specific part of your customer experience like support, onboarding, sales, upgrades, training, etc. We even used it to measure the quality of some of our content (ebooks and webinars). I always wanted to have new customers rate their sales reps this way, which would have been a way to evaluate their performance on something more than just revenue, but we never did it. If I were to start a company today (and we had sales reps) I would measure the NPS of each rep. Employee NPS - As part of our pioneering work in employee engagement, we regularly asked employees "How likely are you to recommend working here to a friend?" and learned a lot from the overall score, scores by tenure, scores by department, and especially the text comments. I always wished I could have seen the responses correlated with employees' performance ratings, but we never figured out how to do that and maintain confidentiality. If I were to start a company today, I would do all this using TINYPulse, which I used with my whole team for the last couple years and am a big promoter (and also advisor and investor). What's a good benchmark for my startup NPS score? In the book about NPS there are some examples of NPS scores for different companies, but the only real benchmarks for NPS that I know of are in the Zendesk report on NPS scores (the data is summarized nicely here by Tom Tunguz). Basically it says B2B companies have an average NPS of 29, and B2C companies 32. However, I cannot find any information in the report about how the surveys were distributed and if they really included 100% of customers, and the scores are higher than I tend to hear from software companies that verbally tell me their real NPS. My gut tells me that the scores skew high because this was a group of Zendesk customers that opted into sending this NPS in beta, they companies selected the list and sent the emails themselves, and the main contact Zendesk worked with was likely the person using Zendesk who is most often a customer support person, not marketing or product person, all of which mean to me mean the scores might be skewed high. In my experience, B2B tech companies have an NPS of around 15-20. And I know companies that have had a low NPS that grew a lot and companies that had a high NPS that did not. NPS is not a huge factor in the growth formula in most cases, though a higher NPS helps for sure. A few more comments about NPS benchmarks and trends. Culture affects it - Europeans tend to give lower scores than Americans and I've seen Asian countries be biased up or down depending on their culture. B2B companies that sell to very small businesses (think Constant Contact selling to mom and pop shops) often get a little higher responses similar to consumer, while most companies selling to enterprise IT departments get pretty low scores. And be careful if you ask another founder or exec what their NPS is since people tend to exaggerate a bit if their score is not amazing. Their first response might be that their NPS is 46 but that might be among customers who signed up this quarter when overall it is 20. Finally, if you are growing (going international, raising prices) or your business model is changing (going upmarket, etc.) those things can be changing your NPS score without you realizing it. The best use of NPS is the text feedback which you can use to improve your customer experience. The second best use of NPS is for understanding which types of customers (by size, geo, product, user persona, cohort or tenure, etc.) are more or less happy (by NPS score) and why (using the text comments). The third best use of NPS is as a way of understanding trends in your overall customer happiness over time. * To get a sense of the NPS of your customers as compared to your competition, I would hire a research firm to do an NPS survey for you and your competitors (this will cost you $10k-20k+ and it not worth it in many cases). That way you know that the survey was distributed in the same way to audiences that are similar, and it was done without bias (not coming from the company asking about themselves). How else can I measure my customer experience besides NPS? tl;dr: Measuring the NPS of your customers is a valuable tool for your company, and it can be used in many ways. Just don't limit yourself to only using NPS to measure your customer experience. And don't spend too much time trying to benchmark your NPS against the competition. If you have used NPS in any creative or interesting ways or have gained a special insight from NPS, please share your story in the comments. Thanks!